WASHINGTON -- A storm that arrived postcard-pretty in the nation's capital Friday was morphing into a painful, even paralyzing blizzard with gale-force winds pushing heavy snow and coastal flooding. One in seven Americans could get at least half a foot of snow by Sunday, and Washington could see snowdrifts more than four feet high. The first flakes were lovely, but forecasters warned that much, much more was on its way. Not that anyone will see the worst of it: Much heavier snow and wind gusting to 50 mph should create blinding whiteout conditions once the storm joins up with a low pressure system off the coast, said Bruce Sullivan, a forecaster at the National Weather Service's Weather Prediction Center in College Park, Maryland. Two feet or more of snowfall is forecast for Washington and Baltimore, and nearly as much for Philadelphia. New York City's expected total was upped Friday to a foot or more. But Sullivan said "the winds are going to be the real problem; that's when we'll see possible power outages." The result could create snowdrifts four to five feet high, so even measuring it for records could be difficult, he said. 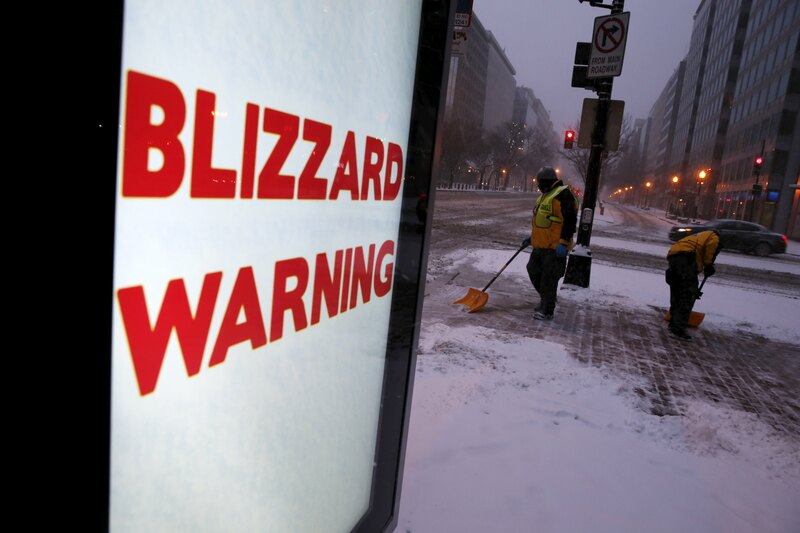 By evening, wet, heavy snow was falling in the capital, making downed power lines more likely, and yet many people remained on the roads, Washington Mayor Muriel Bowser said. "Find a safe place and stay there," she beseeched. Chris Geldart, director of the District of Columbia's Homeland Security and Emergency Management Agency, told CBS News he was concerned about the deadly nature of the storm. "Our first concern, really, is for the residents," Geldart said. "One of the major models of success for me personally is to make sure that we don't lose anybody. That's first and foremost." D.C. Police Chief Lanier said Friday the time to be outside had passed. "No matter how pretty the snow is, if you go outside, while this storm is going and the winds are blowing high, you are really putting yourself at risk," Lanier said. At least nine people died in storm-related crashes before the worst of the storm, including Stacy Sherrill, whose car plummeted off an icy road in Tennessee. Her husband survived after climbing for hours up a 300-foot embankment. "They're slipping and sliding all over the place," said Kentucky State Police Trooper Lloyd Cochran -- as soon as one wreck was cleared, other cars slammed into each other, causing gridlock for hours on interstate highways. Conditions quickly became treacherous all along the path of the storm. Arkansas and Tennessee got 8 inches; Kentucky got more than a foot, and states across the Deep South grappled with icy, snow-covered roads and power outages. Two tornadoes arrived along with the snow in Mississippi. The storm could easily cause more than $1 billion in damage, weather service director Louis Uccellini said. All the ingredients have come together for a massive snowfall: The winds initially picked up warm water from the Gulf of Mexico, and now the storm is taking much more moisture from the warmer-than-usual Gulf Stream as it rotates slowly over Mid-Atlantic states, with the District of Columbia in its bulls-eye. At least meteorologists appear to have gotten this storm right. Predictions converged and millions of people got clear warnings, well in advance. Blizzard warnings stretched to just north of New York City. Boston and other New England cities should get a less windy winter storm, and much less snow. In all, 82 million Americans will get at least an inch of snow, 47 million more than six inches, and 22 million Americans more than a foot, Ryan Maue at WeatherBell Analytics said Friday. Fortunately, temperatures will be just above freezing after the storm passes in most places, and there's no second storm lurking behind this one, making for a slow and steady melt and less likelihood of more ice and floods, Peterson said. As food and supplies vanished from store shelves Friday, states of emergency were declared, lawmakers went home, and schools, government offices and transit systems closed early around the region. Thousands of flights were canceled, sporting events were called off, bands postponed concerts and NASCAR delayed its Hall of Fame induction ceremony. Broadway's shows were still going on in New York, but as snow fell in Atlanta, people there were urged to stay home all weekend, rather than risk a repeat of the city's 2014 "icepocalypse," when a relatively mild winter storm caused days of commuter chaos. Travel was already impossible across a wide swath of the Ohio River valley. Nashville, Tennessee, was gridlocked by accidents. Several drivers died on icy roads in North Carolina. In Washington, Baltimore, and Delaware, archdioceses pre-emptively excused Catholics from showing up for Sunday Mass. Coastal flooding and the loss of beaches from high surf were major worries from Delaware north to Long Island. New Jersey's Republican Gov. Chris Christie canceled presidential campaign events in New Hampshire, which should be spared from the storm. "I'm sorry, NH but I gotta go home -- we got snow coming," Christie wrote on Twitter. Late Friday, Christie joined other states and declared a state of emergency in New Jersey. In Washington, the federal government closed its offices at noon, and all mass transit was shutting down through Sunday. President Barack Obama, hunkering down at the White House, was one of many who stayed home. Republican presidential candidate Carly Fiorina addressed anti-abortion activists at the annual March for Life as the storm closed in. "I would come here if it were thunderstorming," said Kristlyn Whitlock, 20, who came from Steubenville, Ohio, wearing four layers of pants and five layers of tops to stay warm. In downtown Baltimore, social worker Sean Augustus stocked up on flashlights and water, but said his city comes together when disasters strike. "This is when you'll see Baltimore city in a different light," Augustus said. "You'll see neighbors coming together to help each other. That's the side of Baltimore people rarely see." A similar spirit was evident in Annapolis, where 350 Navy midshipmen signed up to shovel people out. More than 7,600 flights were canceled Friday and Saturday -- about 13 percent of the airlines' schedules, according to the flight tracking service FlightAware. They hope to be fully back in business by Sunday afternoon. One of the unlucky travelers stranded by the storm was Jennifer Bremer of Raleigh, North Carolina. Bremer flew into Chicago on Thursday morning, carrying only a briefcase, for what she thought would be less than a day of meetings. Her flight home was canceled Thursday night, and then again Friday. "I have my computer, my phone and a really good book, but no clothing," Bremer said as she eyed flight boards at O'Hare International Airport. "I have a travel agent right now trying to get creative. I'm waiting on a phone call from her.... I'm trying to get somewhere near the East Coast where I can drive in tonight or early tomorrow morning." Thousands of track workers, power company employees, road crew members, firefighters, police, National Guardsmen and others mobilized to help out over the long weekend. "For our region, this is good timing," said Jeffrey Knueppel, general manager of the Southeastern Pennsylvania Transportation Authority, which is suspending almost all service around Philadelphia Saturday. "Saturday is the day to stay home and Sunday will give us a chance to really clean things up." Passengers on a cruise ship heading back to snowy Baltimore from the Bahamas were going to spend one more day at sea. The Maryland Department of Transportation said Friday that the blizzard means the port won't be ready for the Royal Caribbean International's Grandeur of the Seas until Monday. Royal Caribbean spokeswoman Cynthia Martinez said the ship was to return Sunday from an eight-day trip to the Bahamas.